Bulletproof electro-mechanical American belts and motors powered by a lithium battery that is rechargeable via a magnetic-induction dock. What else but the Devon Tread 1? Announced in 2010, it arrived in Australia last year, but I had not managed to see it until recently. As is now well known, time is illustrated on the Devon Tread via the use of belts (the eponymous treads) and read through windows placed over the belts. Incredibly large but surprisingly ‘light’ given its size and presence, its stainless steel case is 53.3mm by 47mm and 19mm thick, the crystal is polycarbonate (hence the bullet-proof comments, as it is the same material used for bullet-proof glass). Part gadget and part watch, inside the Tread 1 is quartz based assortment of microstep motors, belts, and a processor, which controls the functions and all the motors. 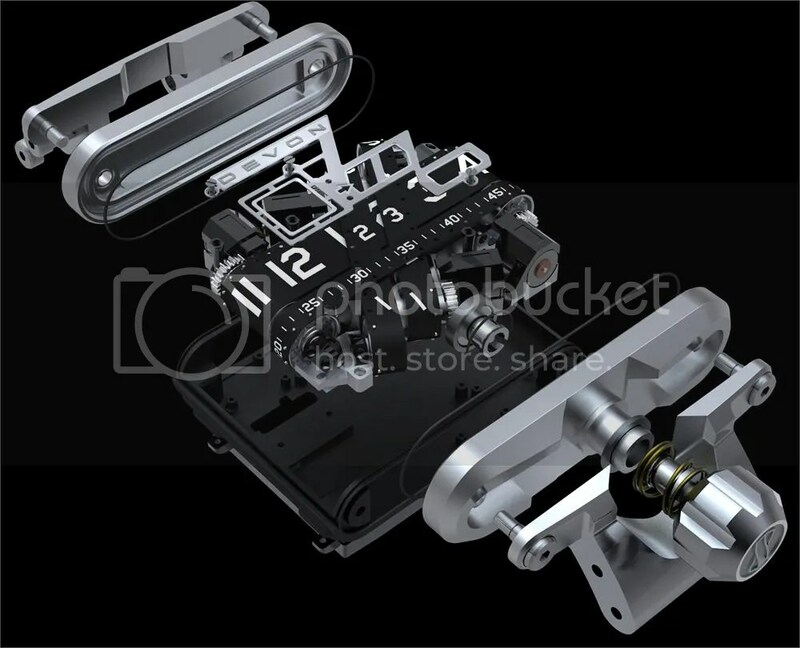 The belts are driven by four tiny motors, which are co-ordinated by an on board microprocessor. The ‘crown’ at the bottom of the watch is more akin to a on/ off button. Just for good measure, the window is made of a bulletproof polycarbonate. This film supplied by Devon shows its operation; as time passes, a motorised tread moves. As mentioned, the watch is powered by a lithium polymer battery. It has an approximately two week power life, and is recharged by placing the watch on top of a magnetic induction charger. Naturally, its somewhat of an energy guzzler, but the Tread 1 does include a quiet ‘off’ mode. When it is in this energy saving mode, the watch stops showing the time and goes silent. It is still ‘telling’ the time, but it doesn’t show it until you reactivate the watch. This is a watch meant to attract attention, and it certainly does that. Placed in its own section of the retailer’s window, it was impossible to miss and on the wrist, impossible to ignore. There are four iterations of Devon Works’ Tread 1, called A – F. Stainless steel with different treatment (polished, brushed, DLC) and since its release, a Tread 2 has also come out. The brand is named for its founder and creative majordomo Scott Devon, and not for any Australian link. If you want to see this watch ‘in the metal’, and it is worth taking a look at, there is one here in Sydney at Vendome Wollahra’s CBD boutique. It is definitely a niche timepiece, and not just because of its size and distinctiveness, but regardless of whether it’s your type of timekeeping tea or not, you have to admire its design and technical inventiveness. It was a lot bigger than I had thought it was based on photos. One that has to be seen to be believed! saw that in person yesterday. it’s massive!!! 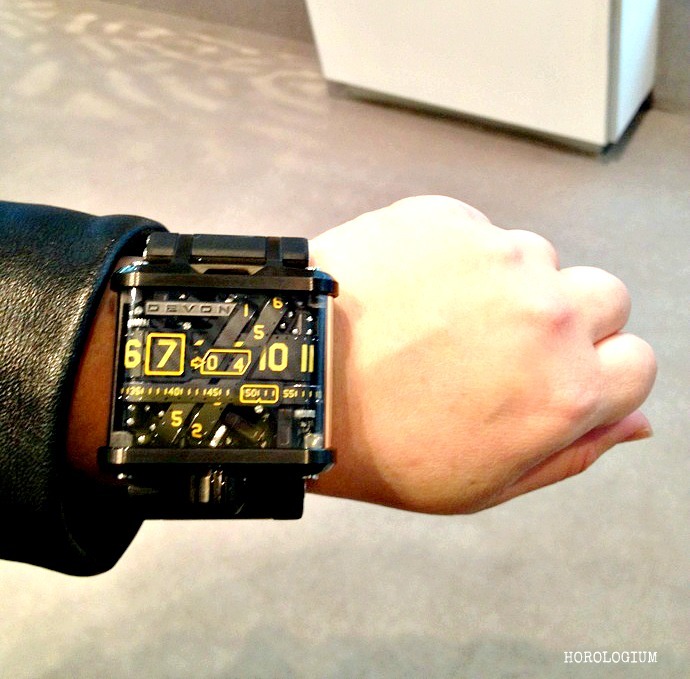 although i was quite surprised at the price of the Romain Jerome Titanic steampunk watch- not bad for $15k…. Yes, it is rather large…Didn’t know that the RJ Titanic was $15k.